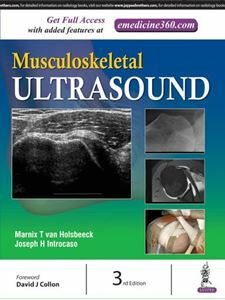 “Musculoskeletal Ultrasound” is the third edition, intended as a print and electronic book, combines text, static and dynamic ultrasound images, line drawings, 3-D animations, and variable combinations of audio and video. The glossary and search functions now replace the old index. The glossary contains crucially important terminology often illustrated by graphic material. A truly interactive feature will be the Continuing Medical Education (CME) offering of this book, which will be available shortly. This third edition contains more information on ultrasound anatomy, indications for musculoskeletal ultrasound examinations, and information on pathology and ultrasound signs of disease. This new edition shows more maturity in part because the field has finally gained widespread acceptance. The recent rapid growth of this technique and evidence of an ever-increasing number of followers prove that musculoskeletal ultrasound represents an important tool in the hands of the contemporary musculoskeletal practitioner. Chapters 4 to 6, 8, 10, 11, 15, 16 and 18 to 21 contain video(s).